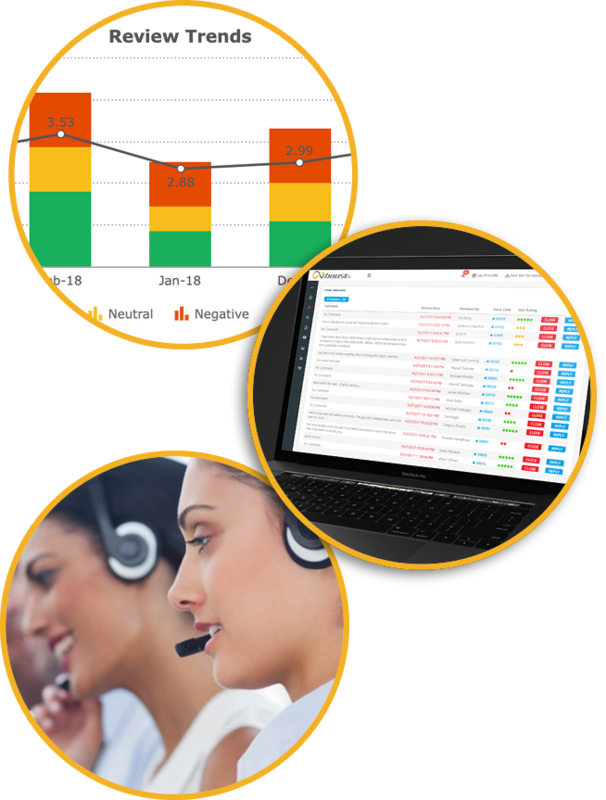 A robust feedback collection solution for capturing employee and or customer feedback throughout the customer journey. Create branded multilingual surveys and collect feedback via web, SMS, intercept or in-app surveys based on a scoring methodology that fits with your organization’s needs. Integrated fraud detection eliminates employee “gaming” to ensure an accurate representation of the customer’s experience. Collect feedback throughout the customer journey and allow consumers to choose the medium with which they provide their feedback. Send survey invitations in a customer preferred language or allow customers to choose which language they prefer from within the survey. Verbatim responses are displayed in native language or translated within reporting platform based on preferred display language. Trigger real-time alerts based on keywords, low score surveys or reviews. Alerts are auto assigned based on the organizations business rules with automated escalations based on defined thresholds. Track alert response times and number of escalations to monitor the responsiveness of your organization. Ensure your customer issues are addressed and customers are contacted with a resolution in a timely fashion. Closed loop case management ensures customers are in fact contacted with a resolution. Customers receive an automated email survey on every closed alert to ensure there issue has been resolved. Timeliness of response to a customer complaint is critical. 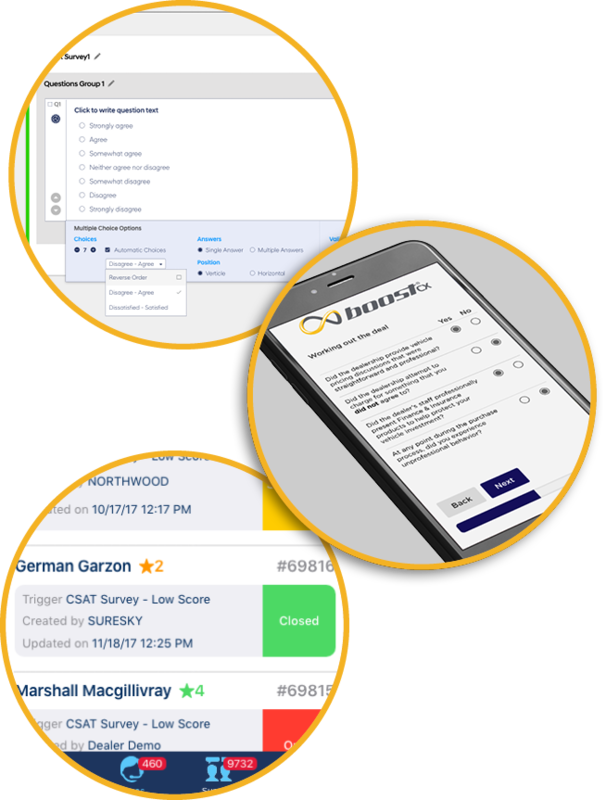 The boostCX mobile app provides users with the ability to review alert details, email or call customers and then close or reassign an alert from within the native iOS or Android app. 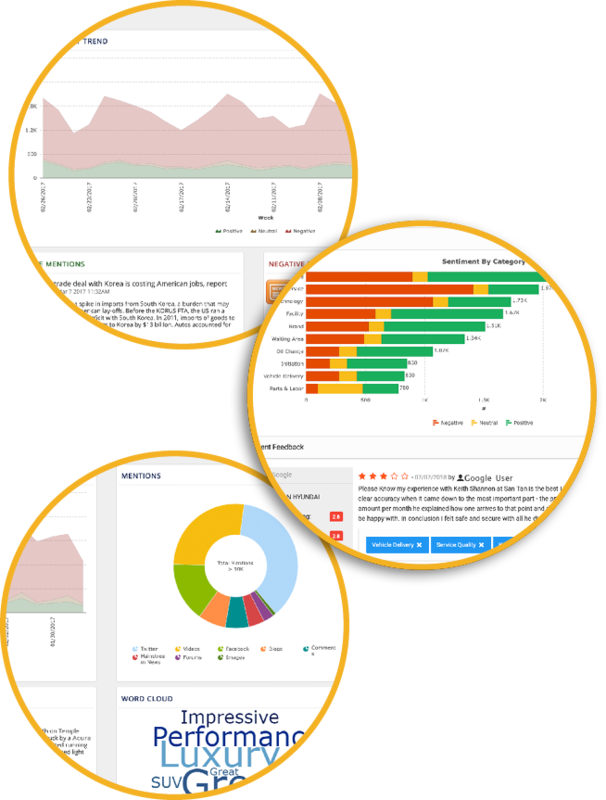 A cloud based, fully customizable multilingual hierarchy based dashboard with Key Performance Indicators (KPI’s), highlighted areas of focus and alert management tools. A role based dashboard with consolidated survey and online review scores provide a holistic view of the customer experience. 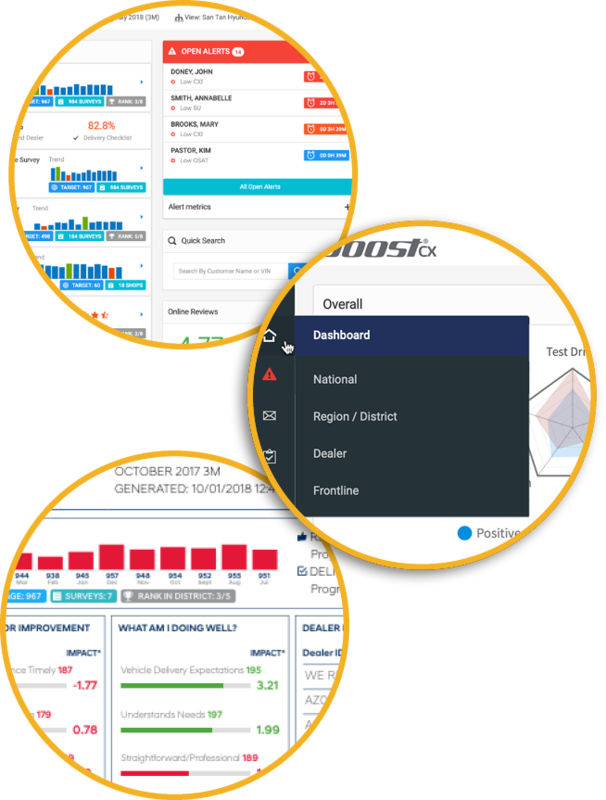 The intuitive interactive dashboard allows users to view aggregated results or drill into additional detail as required. A full suite of customizable hierarchy based reports including trend, ranking and performance reports with clearly identified areas of focus based on feedback collected. Filter reports by period type, dates, or client defined segments. Build cross tab or custom reports based on survey sources, survey questions, selected dimensions and variances. Save or share customized reports with other users. Turn feedback and insights into actionable data. Generate role based performance management report cards with program KPI’s and identified areas for improvement. Include online review and verbatim comments to provide better visibility into the true voice of the customer. Publish report cards to PDF or send automated weekly user report cards via email to portal users based on a client defined report card template. Customers share comments and feedback about your organization through social media, surveys, review sites and many other channels. Unfortunately this feedback is unstructured and disorganized which makes it difficult to action. boostCX Insights uses machine and human learning to automatically analyze text feedback to identify customer pain points and provide your organization with valuable insights into the customer experience. Utilize rule-based topic definition to categorize verbatim and social review comments into line of business or areas of focus. Monitor sentiment and measure impact of categories on CX or review scores. Utilize theme detection to understand what’s important to customers. Make sense of unstructured verbatim feedback from both verbatim and social comments. Visually identify areas of customer concern based on sentiment and frequency of mentions. Drill into themes to view customer comments and gain a better understanding of customer concerns. Monitor and drill into trend social reviews and comments across multiple online review sites filtered by date, source, positive, neutral or negative review rating. Reply directly to social reviews from dashboard or mobile app. View “heat map” of social ratings across multiple regional or national maps. Compare reviews and customer comments by dealer, region, district, or nationally. Compare social reviews to competitor locations. Monitor rank within market and compare total review counts. Aggregate competitive brand online review scores by district, region or nationally. Compare “heat map” of social ratings to competitor within regions or nationally. Monitor brand or product comments and sentiment posted public social media sites, blogs microblogs and news sites. Monitor sentiment trends and drill into comments to gain insights into customer feedback. Engage negative customers before their message goes viral. Respond to customer reviews directly within the desktop portal or via the mobile app. Track timeliness of user responses and ensure closed-loop follow up for all customer identified issues. GoalLine Solutions provides live agent dedicated technical support for all platform users. From program launch through to ongoing user support issues, password resets, or program questions, our dedicated support team is available ensure your employees have the assistance they need. To request additional information please fill out the form below and we will respond promptly.